Waterfowl and fish know where the most sacred places are on a river. The breath of the river rises at such a place. The healing song it sends forth through its rising mist is heard spiritually by all things residing in and around the river’s waters. The songs of the waterfowl and fish join in sacred harmony with that of the river. Such are the instructions of our Creator. 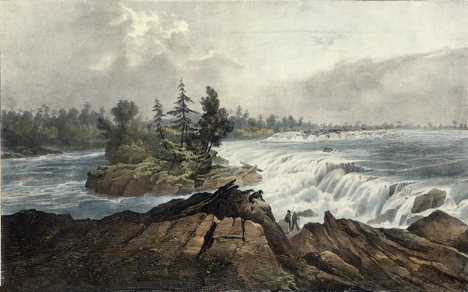 Painting of Asinabka, wild and free, before the dam. 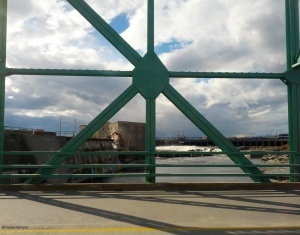 As human beings we need to understand clearly that it is no more possible for a developer to purchase Asinabka (Chaudière Falls and the islands around them) than it is for you or I to purchase it from the birds and fish who honour it with every beat of their hearts. Yet there are people with untold wealth who would have us believe that they are the true stewards of Asinabka. “It is private land,” they tell the courts, “we are the rightful owners of it.” How did it all come to this? What greed and treachery occurred in the past to make it so a colonizer could utter such nonsense today? 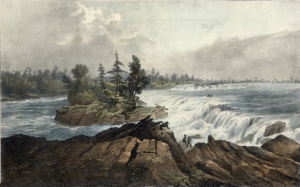 The waters of the Falls spilling over the glare rock in the centre of the circle of the ancestral lands of the Algonquin Anishinabe carry the memories of the sturgeon and eels who lived in them since even before the creation of human beings. If we want to see who truly has stewardship of Asinabka, let us look to them. Only when the sturgeon and eels are ready to bargain away Asinabka to a developer, will I finally concede that all is lost and take my place in line with my hand extended, palm turned upwards, waiting for cash to be slapped onto it. If the dishonourable settlers of the past who stole Asinabka away from the Algonquins were still alive today, I would demand that they be thrown in jail for what they did. What does Creator think of a man who believes money can buy a place of sacredness? A place acquired at the hands of thieves! What do we call a settler society that would allow it to happen? Since when can a stranger enter your home and defile your sacred bundle as he sees fit, while claiming all along that he has every legal right to do so? As the original inhabitants of this land, are we not entitled to some form of protection of our most sacred place of healing? When the settler community denies us our sacred place, then I must wonder if they even regard us as human beings. If a tyrannical leader of a faraway land were to oppress a minority of his country in such a way, the settler community here would condemn him even to the point of taking up arms to force his ouster. The Christians of the world call what ISIL fighters are doing to believers of Jesus as a saviour in the Middle East genocide. But here in Canada’s national capital, most Christians remain silent while a developer readies his machinery to destroy a most precious and sacred site of the First Peoples. What does it say about Christianity when Christians pick and choose whose spirituality is worth protecting? After all, it is wrong to do nothing about it in the eyes of God, as well as in the eyes of humankind. Asinabka today, behind bars. Photo by Julie Comber. The storms of life in which money swirls thick and heavy, blind many people from seeing the goodness of their own hearts. The trail leading to the knowledge of what it is to be a human being becomes evermore obscure to them and makes finding it difficult even when a tragedy occurs within the circle of their own families. The development of the Chaudière Falls will prove only that the people of the settler community are at peace with continuing the abuse of Peoples who have suffered far too much already. Let us stand in solidarity as human beings at Asinabka to stop development. With the spirits of the Falls and those of the land by our side, we will not fail. This entry was posted in Community, Idle No More, Spirituality and tagged Akikodjiwan, Albert Island, Algonquin, Anishinabe, Asinabka, Chaudière Falls, Chaudière Island, condos, Justin Trudeau, OMB, Ottawa, Petition, Reconciliation, Reconciliation River, sacred land, sacred waters, unceded, Victoria Island, Westeinde, Windmill Development Group, Zibi. Bookmark the permalink. One Response to Asinabka: Impossible To Buy! Every minute that I spend at Asinabka is a healing moment. The very land and water, air and creatures flying and walking, plants and insects share their love with me there. I can feel it there. It is real. Yes, that is also true everywhere, however, at Asinabka it is so gentle, so strong. I wonder, is it because of the thousands and thousands of years of sacred ceremonies and joining that the ancestors did there, and even now still maintain for us there?